Jack Million Casino: Pick up to $1000 + 200 Bonus Spins! Jack Million Casino is throwing everything they’ve got at this new player bonus! Get hold of five deposit bonuses worth up to $200 each and 200 Free Spins over your first five deposits! Use the bonus code to claim your first set of 40 Free Spins which can be enjoyed on the fantastic ‘Gemtopia’! Expect sticky wild re-spins, free spins and bonus rewards! *18+ only. New players only. Minimum deposit $20 required. Bonus code must be used to claim. Wagering requirements 40x the bonus plus deposit amount. Bonus funds expire after 30 days. ALWAYS GAMBLE RESPONSIBLY. 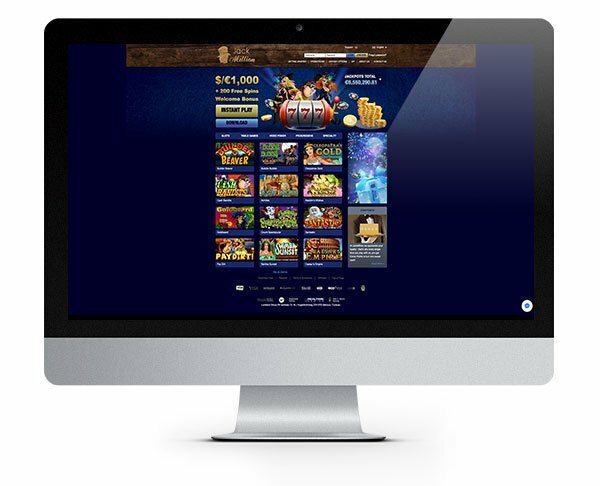 Jack Million is an online casino powered by Real Time Gaming. If you aren’t familiar with this software developer, then you might want to pay close attention as they offer a great selection of unique games that aren’t like anything you’ve played before! In terms of design, Jack Million looks ok although it’s maybe a little rough around the edges. It has oodles of charm though, and whether you have come here for a serious gambling session or simply to have a little game or two on some of their slots, they have everything geared up for you. You can decide how you want to play: instantly or via their downloadable casino software. If you choose to dive right in and play instantly via your internet browser, you’ll be offered a selection of their most popular games ready to play in seconds. Downloading the software will give you access to the full suite of games and their thrilling slots tournaments! In both modes you can practice or “play for fun”, switch to “play for money” to play for real. All the various processes have been created to be simple and hassle-free, but should you require any assistance in setting up your account, making a deposit or claiming any of their bonuses then you can find their customer support team available 24/7 via live chat and email. All of the games you will find at Jack Million have been developed by Real Time Gaming or RTG if you’re feeling lazy! These guys have a decent history in the industry and regularly add titles to their already impressive line-up of games. This means you can enjoy games spanning all manner of themes and genres, so they have something to suit all tastes. While they might not quite live up to the impressive graphics we see from some of the industry leaders, the games have a charming and authentic feel to them that fans of land-based slot games will appreciate. The collection includes 3-reel classic slots, 5-reel and 6-reel video slots. They are well-known for their unique bonus features and also progressive jackpots, so they offer something different with each game you discover! Cleopatra’s Gold and Megasaur being two of our favourites! While RTG is well known and much loved for their slots, they also offer up a good choice of classic casino games. At Jack Million you can play Baccarat, European Roulette, European Blackjack, Suit em’ Up Blackjack, Carribean Stud Poker and Keno amongst others. New Player Bonus: up to $1000 PLUS 200 Bonus Spins! Jack Million as created a five-part deposit bonus for all new customers! You’ll need to register and verify a new casino account and make a qualifying deposit of $20 or more using the promo code ‘WELCOME’ to opt into the offer. 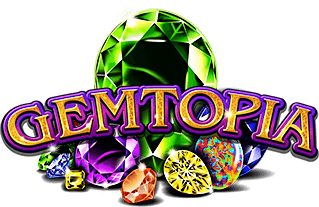 With each of your first five deposits, you’ll receive a 100% match bonus worth up to a maximum of $200 PLUS 40 Bonus Spins to play on ‘Gemtopia’. So that’s a total bonus earning potential of up to $1000 and 200 Bonus Spins! IMPORTANT NOTICE – Make sure you are aware of gambling regulations in your country of residence before you register at Jack Million Casino. Jack Million is powered by Real Time Gaming and is home to some of their most popular slots including Cleopatra's Gold and Megasaur! 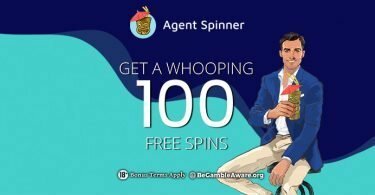 Agent Spinner Casino: 100 No Deposit FREE Spins on Spinions: Beach Party! 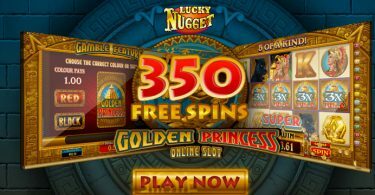 Lucky Nugget Casino: 350 Free Spins Bonus EXCLUSIVE!